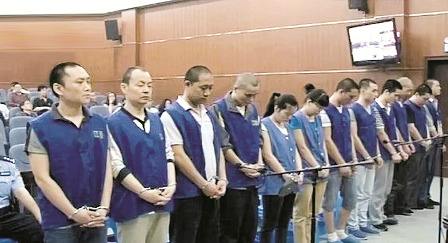 A gang of 12 organ traffickers including surgeons, anaesthetists and nurses on on trial in Wuhan accused of selling organs for up to 360,000 yuan ($58,000). In a case know as the "undergound kidney trafficking network" the 12 are accused of buying and selling kidneys in a million-yuan scheme scheme in which donors were paid 30,000 yuan ($5000). According to the Anhui News, the gang performed six commercial organ transplant operations between 2012 and 2013, for which they charged between 170,000 and 360,000 yuan ($27,000-58,000), which was divided up between the participants. The gang included a surgeon called Dr Chen, an anaesthetist Dr Peng, an assistant surgeon Dr Yao, two surgical nurses, and two follow-up nurses. There was also a group of 'fixers and 'agents who bought medical equipment and drugs and who set up the deals and arranged premises in the Jiangxia district in which to perform the illegal operations. Other gang members arranged transport and liaised between medical staff and buyers and sellers. Eleven members of the gang have already pleaded guilty to the offences. The ringleaders of the gang were an agent called Deng and Dr Chen. Deng set up the deals through the internet, making contact with people looking for an organ and also contacting people who were willing to sell one of their kidneys. Deng said he received 34,000 yuan ($5500) for each deal. One donor in the court said he could now put his heart at rest. he said he greatly regretted his disastrous decision to sell one of his kidneys when he was deeply in debt. now he said he was easily tired and had lost all his strength after the operation. Xinhua report does not say at which hospital the doctors worked or who the buyers of the organs were, nor what the outcomes of illegal organ transplant surgery were.